This short article should reflect the current status of Microsoft SQLSRV module on Zend Server PHP 5.5 branch. 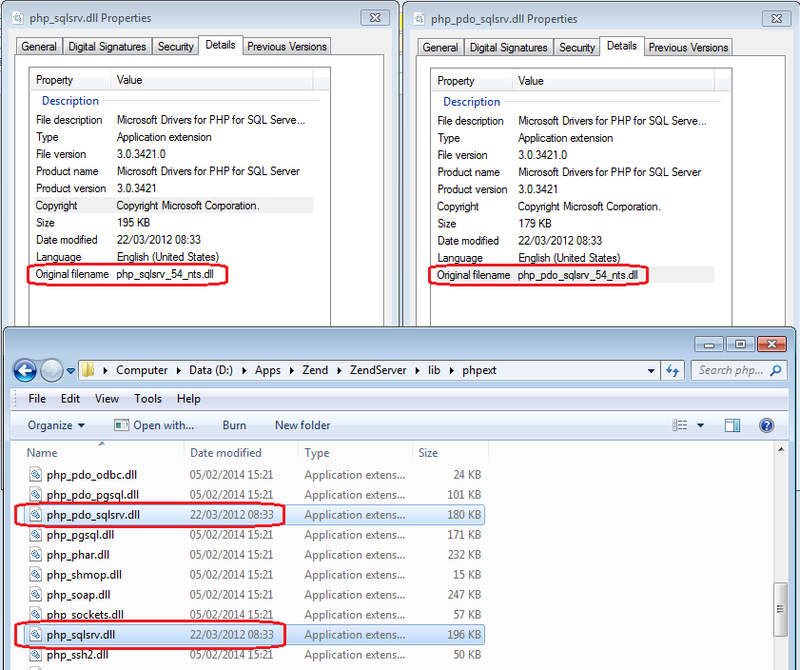 At the time of writing, Microsoft did not yet release official PHP 5.5 (or later) modules for SQLSRV and PDO-SQLSRV. SQLSRV and PDO-SQLSRV are available for PHP 5.3 and 5.4 NTS, therefore should work within Zend Server 6.x with PHP 5.3 and 5.4. Selecting MSSQL when installing or modifying Zend Server on Windows and enabling the Module(s) in Zend Server UI should work out of the box. If this is not the situation, please contact Zend Global Support to report an issue according to your SLA. Zend Server 6.3 with PHP 5.5 does not support SQLSRV - see Zend Server Release Notes. As the shipped SQLSRV is not going to work on this Zend Server version, simply disable it and ignore the extra SQLSRV module. So far unofficial builds we located for SQLSRV PHP 5.5.x NTS are using VC11, which are incompatible with Zend Server PHP 5.5.x NTS VC9, thus cannot load properly in our supported PHP stack. To remove any doubt - if an unofficial build could be loaded into Zend Server PHP 5.5+, it is still not supported since it does not originate from Microsoft or Zend labs. Any unofficial module should be disabled /unloaded from Zend Server prior to reporting any issues to Zend. Excerpt: This short article should reflect the current status of Microsoft SQLSRV module on Zend Server PHP 5.5 branch.